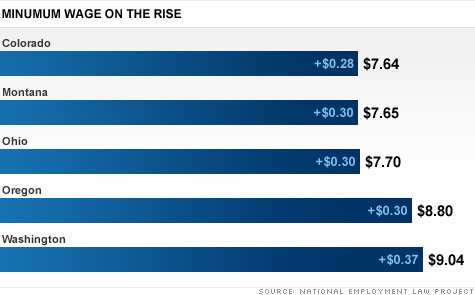 NEW YORK (CNNMoney) -- Minimum-wage workers in eight states could see their paychecks grow by hundreds of dollars next year, thanks to automatic annual increases in the rates. Colorado, Montana, Ohio, Washington and Oregon recently announced their 2012 minimum wages, which contain bumps ranging from 28 cents to 37 cents per hour. This translates into annual raises of between $582 and $770 for full-time workers at that end of the pay scale depending on where they live. Washington workers enjoy the highest minimum wage, which will rise to $9.04, a boost of 37 cents per hour and $770 per year. Arizona, Florida and Vermont are expected to announce the increases in their rates in coming weeks. These states are taking action because their laws require that their minimum wages adjust annually to keep pace with inflation. The rate increases come at a time when many Americans are seeing their incomes stagnate. For those in the middle of the pay scale, income fell to $49,445 last year, when adjusted for inflation, a level not seen since 1996, according to census figures. And over the 10-year period, their income is down 7%. The federal minimum wage stands at $7.25, which is just over $15,000 a year for a full-time worker. That's less than the poverty rate for a family of four. The federal rate, which is not indexed for inflation, was last increased in 2009, when it rose by 70 cents. Some 18 states, plus the District of Columbia, have higher minimum wage rates. The automatic state increases are among the few points of upward pressure on wages, said Jen Kern, minimum wage coordinator at the National Employment Law Project, an advocacy group. "We can't afford to have workers' buying power erode when, in fact, we need spending to get the economy going," she said. The minimum wage is taking on increased importance in this economic downturn because the jobs that are being created these days skew toward the lower end of the pay scale. Some three-quarters of minimum-wage workers are at least 20 years old and 60% are women, according to NELP, citing federal statistics. An analysis from NELP earlier this year showed that 76% of jobs created in the first seven months of 2010 were in low- to mid-wage industries -- those earning between $8.92 to $15 an hour, well below the national average hourly wage of $22.60. Some experts say that an important first step to getting the economy out of its slump is to boost the federal minimum wage to the $10 range. However, business groups say that could force companies to further cut back on hiring. Lawmakers in several other states, including California, Maryland, Illinois and Massachusetts, introduced legislation this year to raise their minimum wages and add an annual cost of living adjustment, according to NELP. An effort to increase the federal minimum wage may be launched next year, Kern said.